I am so excited to share a picture of an A-D-O-R-A-B-L-E baby shower cake we just received. 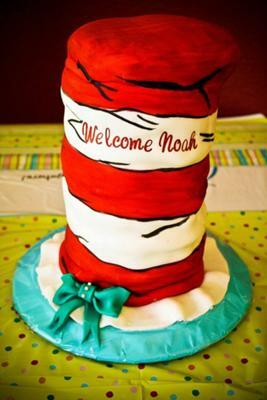 Take a look at this cat in the hat cake! It looks like it stepped out of a Dr. Seuss story book. I love the colors and design. And painting the design on the fondant is a fabulous idea. So stinking cute! A big thanks to Nichole for sharing her cake photos and tips with us. You did a beautiful job on it Nichole! I had someone ask me for a cat in the hat baby shower cake, I had an idea in my head and made it come to life. I stacked 9 layers of 6 in. rounds covered in homemade marshmallow fondant. Painted the red stripes with red food dye, and used a black edible marker for the cartoon look, added a white fondant skirt to look like a ruffle, and used blue fondant to make a bow at the bottom. I used pearl pins to secure the bow, and used red glitter lettering to say "Welcome Noah". Join in and write your own page! It's easy to do. How? Simply click here to return to Baby Shower Edible Cakes.